After seven years of rough conditions, calmer waters have finally allowed archeological dive teams to locate underwater remains of a long-lost Roman city off the coast of current-day Tunisia, which was submerged by a tsunami over 1,600 years ago. The thriving port of “Neapolis,” (the Greek words for “new city”), disappeared beneath the waves after an 8.5M earthquake rocked the ancient world near Crete, and followed closely by a giant, tsunami wave. 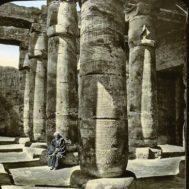 Tom Hale at IFL science noted that accounts, mainly from the Roman historian Ammianus Marcellinus, stated that on the morning of July 21, 365 CE, a number of towns in Crete, as well as parts of Greece, Cyprus, Sicily, Spain, and North Africa, were destroyed. 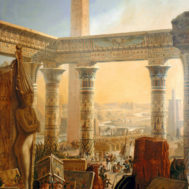 Marcellinus also reported that the city of Alexandria, in Egypt, was also badly damaged at the time. The quest to find “Neapolis”, near the current day coastal town of Nabeul in Tunisia, has been on the Fanter team’s archeological radar for the last 10 years, but until this summer, ocean conditions have been too turbulent to allow dive teams any success. A combined project by the National Heritage Institute and the University of Sassari has sent divers to explore the 20-hectare (almost 50 acres) site – an area that was close to a third of the original city and the main area for trade of garum. However the Romans may have viewed the allegiance of the coastal town of Neapolis, they couldn’t live without their ketchup equivalent – the fermented fish sauce called garum – the production of which contributed greatly to the wealth of the thriving port town. So-called liquamen is made in this manner: the intestines of fish are put into a vessel and sailed. Small fish, either the best smelt, or small red mullets, or sprats, or wolf-fish, or whatever is small, are salted together, and fermented in the sun. and frequently shaken. After it has been reduced in the heat, garum is obtained from it in this way: a large. strong basket is placed into the vessel containing the fish and the garum flows into the In this way the liquamen is strained through the basket when it is taken up. The remaining dregs are called alica. 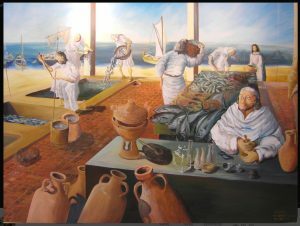 The Bythnians prepare it in this manner: it is best if you take small or large sprats, but if not, wolf-fish or horse-mackerel, or mackerel or even alica, or a mixture of all, and put these into a baker’s kneading trough, in which they customarily knead meal. Toss into the modius of fish two Italian sextarii of salt, and mix thoroughly in order to strengthen it with salt. 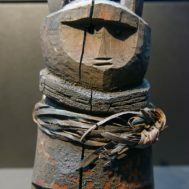 After leaving it overnight, put it into a vessel and place without a lid in the sun for two or three months, stirring with a stick from time to time. Then cover and store. Some add two sextarii of old wine to one sextarius of fish. 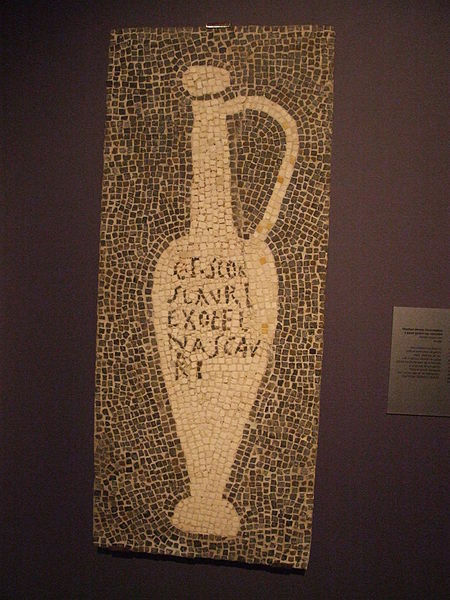 If you wish to use the garum straight away that is to say, not to ferment it in the sun, but to boil it, you do it thus: when the brine has been tested, so that an egg that has been put into floats (if it sinks, it is not sufficiently salty), put the fish into the brine in a newly-made earthenware pot, add some oregano, and place on a sufficient fire until it is boiled, and begins to reduce a little. Some also add defrutum (reduced wine-must). Then put the cooled liquid through a strainer two or three times until it turns clear. Then after covering it, store it away. See also, Andrew Smith’s From Garum to Ketchup, a Spicy Tale of Two Fish Sauces, also from Fish: Food from the Waters, The Proceedings of the Oxford Symposium on Food and Cookery, on the making, popularity, and usage of garum and other sauces. Mother and child, Neapolis Museum, Tunisia, By M.Rais (Own work) [Public domain], via Wikimedia Commons.